I suspect everyone who attended Access: Velocity had the same feeling as we left the Peninsula Hotel on Friday—my brain needs a little break. Age Management Shortcomings. We spent a fair amount of time at Access: Velocity discussing what I consider to be a critical finding—that our reliance on the calendar as a measurement of a used vehicle’s profitability is fundamentally flawed. But our research shows that, as margin compression continues to erode profitability, there needs to be a better way than simply checking off days on a calendar to manage each vehicle to its maximum investment value and return. We discussed two primary reasons why the calendar doesn’t really work as a measurement of each vehicle’s investment value. First, the calendar doesn’t recognize on Day 1 that some vehicles represent a better investment value than others. From the calendar perspective, every car’s a “fresh” car. But, as we’ve come to understand, some cars are really “fresher” than others on Day 1. The calendar simply can’t, and doesn’t, know if you over-paid for a vehicle, or it’s the wrong car. 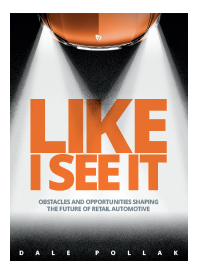 Our research also found that this “fresh car” perspective often results in merchandising and pricing decisions that diminish returns from vehicles with high investment values, and expects unrealistic returns from vehicles with low investment values. Second, the calendar assumes that every passing day exerts the same downward pressure on profitability for every vehicle. But we now know that, in fact, the investment value of some vehicles is more resistant to the advance of time than others. At Access: Velocity, we talked at length about how dealers will need to shift their thinking from the number of days they hold a vehicle to the profit potential each vehicle holds. It was exciting to see how these investment value insights played out at Access: Velocity, and how they represent a path beyond Velocity that will help dealers mitigate margin compression. These investment-focused conversations reaffirmed my sense that, when NADA 2019 arrives, vAuto will be leading the way to a better way of used vehicle inventory management. Inventory Investment Accountability. We had a rich discussion about how dealers can and should maintain more discipline over the amount of money they invest in their used vehicle inventories. Today, it’s not uncommon for dealers and managers to “buy more cars” without regard for the investment return they’re getting from the current inventory. This mindset often contributes to distressed inventory—the cars that often should have been addressed before buying more inventory. I liked one dealer’s solution to this problem. He maintains a strict $3 million cap on his inventory/reconditioning investment, and requires managers to deliver at least $300,000 in gross profit (a 10 percent return) every month. Managers face a penalty if they don’t meet the requirements, which help maintain a collective focus on minimizing distressed inventory. “Predictive” and “Private” Inventory Sourcing: As we discussed how new technology and tools can help dealers reliably predict the investment value of used vehicles, several dealers asked about what I’d call predictive vehicle sourcing, as well as ways to mine private seller acquisition opportunities. On predictive sourcing: Dealers asked if there’s a way, when a vehicle in inventory gets a sufficient level buyer attention (e.g., VDPs, calls, e-mails, etc. ), that they could know it. Through an alert or some other notice, their sourcing team would know, in advance, about an imminent retail sale and begin working to find a replacement unit. The concept makes good sense, and merits attention. On private sellers: Some dealers shared how they mine private seller listings on Autotrader and other third-party sites to find, and pursue, vehicles that match their inventory needs. The effort follows frustration with the seemingly ever-rising costs of acquiring auction vehicles. The dealers suggested that these listings might be integrated into inventory sourcing tools to drive greater efficiencies and time savings. Private, Public Dealer Advantages: Access: Velocity special guest speaker Alan Haig, president of Haig Partners, noted how today’s dealership buy/sell activity is primarily driven by private dealers looking to grow and scale their operations. He also noted that while public dealer groups have grown through acquisitions, they haven’t “figured out how to acquire share from competing stores” when they enter a market. At the same time, Haig suggested that public groups may have a long-term advantage if/when vehicle buyers seek out brands, and the experiences they offer, more than specific dealerships. A Higher Purpose: In addition to providing a unique forum for Velocity dealers, our Access: Velocity event serves a higher purpose—we donate 100 percent of attendee registration fees to charity. This year’s event raised $252,500 for the Juvenile Diabetes Research Foundation—an impressive sum that speaks to the generosity of dealers and their desire to help those less fortunate. My sincere thanks to all the dealers who attended Access: Velocity and shared your insights, perspective and time with me, the vAuto team and your peers. I have a feeling that this year’s event will be remembered as a first step toward positive, profit-focused change that will pay dividends for dealers in the years to come.